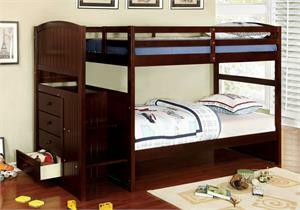 This bunk bed is packed with features you'll love. A front access staircase helps distinguish this set from the herd. Built in drawers on the side of the stairs make for a lavish space saving option. The deep wooden tones and grain offer the room a rustic vibe that's simply charming.